The two people in the car, which was sitting on the tracks in the left-turn lane on McCrimmon Parkway, were able to get out of the car before the train smashed into it. 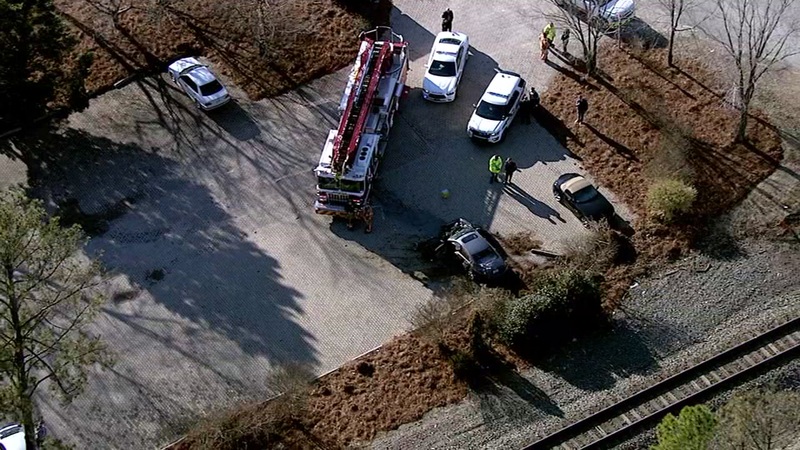 MORRISVILLE, NC (WTVD) -- An Amtrak train struck a vehicle Tuesday afternoon at NC54/Chapel Hill Road & McCrimmon Parkway. It happened shortly after 3 p.m.
No injuries were reported. There were 17 passengers on board the train. The train signal activated, an Amtrak spokesperson said, and there was no malfunction with the vehicle. The train, the Piedmont 74, was on its way from Charlotte to Raleigh. It stopped beyond McCrimmon Parkway. McCrimmon Parkway was closed between NC54/Chapel Hill Road and Church Street while crews work to clear the scene and repair the crossing arms. The closure is expected to last at least an hour. Amtrak is working with local law enforcement on the investigation.